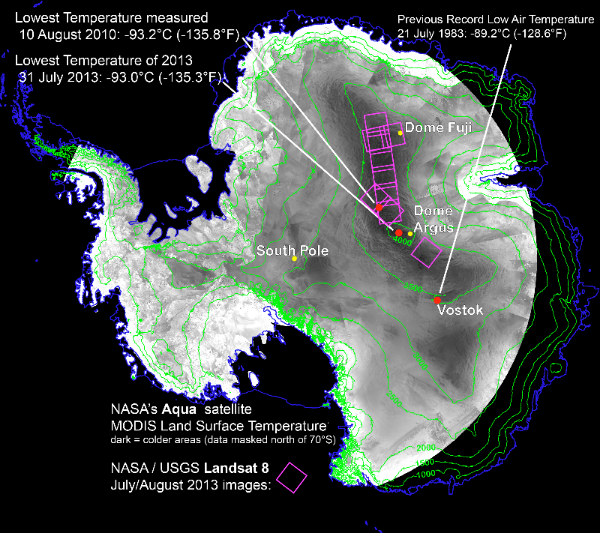 After studying data collected from satellites going around Earth, scientists recently announced that the coldest temperature ever recorded on Earth was on August 10, 2010 in the eastern part of Antarctica. The temperature was -93.2ºC (-135.8ºF). Brrrr, that’s cold! The previous coldest natural temperature ever recorded on our planet was at the Russian Vostok Research Station also on the eastern side of Antarctica in 1983. It was −89.2ºC (−128.6ºF). Here is a video about the coldest place on Earth. The hottest place on Earth is the Dasht-e Lut desert in Iran. It has the highest land surface temperature ever measured by a satellite of 70.7ºC (159.3ºF) in 2005. You can watch a video here.